So you’ve decided to implement new technology (ERPs, EHRs, SaaS, mobile, cloud, etc.) within your organization – congrats! New technology can definitely make your organization more effective and productive, but only if the people within your organization actually use the new technology. I’m sure you have a plan for how you’re going to implement the technology, but do you have a plan for how you’re going to increase user adoption? If users don’t adapt to and adopt the new technology, it is wasted money, effort, and time. Your ROI tanks. User adoption is not just achieved by training users on how to use the new technology, it is achieved by gaining buy-in and commitment. By implementing new technology you are disrupting the daily routine of users. This causes frustration and resistance. If this is not addressed it leads to delays, slows customer response time, and creates employee and customer satisfaction issues. Specific technology is often implemented because of the vendor and name recognition (i.e. SAP, Epic, Oracle), and not because it is necessarily the best solution to meet business needs, or achieve strategic goals. When choosing which technology to implement for your business, don’t just weigh the name of the vendor and the price. Take a look at your strategy. Think about how new technology will help you achieve your strategic goals. The purpose of introducing new technology to a business is to improve performance. Start with the goals you want to achieve, and then plan backwards, finding a technology that best supports improved performance. People are more likely to adopt new technology if they can see how it helps them to achieve their goals and objectives. Achieving user adoption for new technology requires communicating with stakeholders early and often. Before you can communicate with stakeholders you need to have all your stakeholder groups identified. The way each currently performs their work, processes, should be documented. The impacts the new technology will have on them needs to be identified and communicated. Ways in which your organization will mitigate any negative impacts for stakeholders also needs to be communicated. You shouldn’t just be communicating cutover and go-live dates. Engagement requires communicating “with” and not “at” your stakeholders. Communicating for engagement requires audience segmentation. Not all stakeholders will need to hear the same message at the same time in the same way. Informing stakeholders you are deploying new technology because “we need it” or because “leadership says so” or even because “it will help us compete” are not specific enough details to drive engagement – and engagement increases adoption. Technology upgrades or introducing new technologies carries a huge compatibility risk – what if the new systems turn out not to be compatible with those you already have or integration requires more build time than was anticipated. To prevent system integration issues, make sure you review all your current technology systems thoroughly before you consider deploying something new. Don’t just conduct detailed requirements gathering for the new technology, make sure the functionality of your current systems can support and integrate effectively with your new technology. Performing this work upfront will prevent system redundancies, reduce costly build times, and help the budget from ballooning. One of the biggest risks to user adoption is lack of sufficient and customized training. Many vendors offer training options as part of your technology purchase, however, most of this training is standardized off the shelf and not specific to your business processes or culture. Training should not just be screenshots and PowerPoint. People need to see and play in the system, prior to go-live, in the context of their specific work processes. To increase adoption, make sure that training is specific to each stakeholder group and the way they perform their work. One quick way to increase resistance and decrease adoption is to make stakeholders feel they’ve wasted their time with training, and have them end up even more confused because they don’t see the connection to their work. Additionally, not everyone will learn and adapt to new technology in the same way. Consider offering multiple training methods – electronic, classroom, smaller hands-on training labs – various options ensure users feel most prepared. 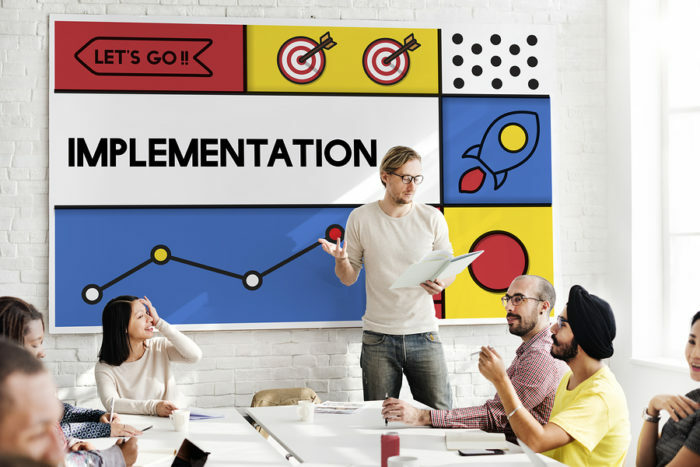 Many organizations are so focused on deployment and conversion, schedules and criteria, that they fail to deploy and integrate a change management process for helping stakeholders adapt and adopt to technology. This is often one of the biggest reasons for rocky deployments, low adoption, and project failure. Technology only achieves desired goals if the people adopt it, if they don’t, technology is just wasted money. To maximize adoption and minimize resistance, your deployment plan and team must be integrated with the change management plan and team. If you don’t have a change management plan and resources in place then you may want to get on that pronto. Technology teams focus on building the technology, resolving technical issues, designing the architecture and deployment of the new technology. Change management teams focus on the people. The change management team directly interacts with impacted stakeholders. They identify areas of concern related to workflow and process. They often identify specific training needs. They handle communication. They frequently advocate on behalf of stakeholder groups, raising concerns and issues to leadership, mitigating risks and alleviating anxieties that can lead to resistance and decreased adoption. To maximize adoption you must place an equal focus on both the technology and the people. Many technology deployments fail to establish an effective governance structure to lead and manage the deployment. Often project management and technology resources are assigned to govern the implementation, but the voice of impacted stakeholders and even customers, is not represented. Effective governance can’t exist in a silo or a vacuum. The governance structure should consist of executive sponsors and a mix of all stakeholders impacted by the technology changes. Think of this structure as a mini organization designed with the mission to execute the technology, change management, communication, training, manage risks and issues, and make project decisions. It is imperative for the individuals serving in a governance role to have the ability to voice concerns on behalf of their stakeholder groups. When people feel they have a voice that represents them and addresses their concerns, they are less likely to resist the technology and adoption is likely to increase. Introducing new technology is likely to cause a major disruption to workflow. Monitor your deployment and consider whether the implementation schedule may need to be revised into smaller more manageable stages. Provide stakeholders opportunities to offer feedback. New technology impacts everyone, so listening to stakeholder opinions and concerns and adjusting your deployment as needed, is important for achieving adoption. Not only does offering opportunities for feedback make everyone feel part of the change, it also gives you important insights into what is working well and what may need to be adapted. Additionally, everything needs to be measurable and observable. Once implementation has begun, do not assume that things will run on their own. Develop measurable success factors and performance metrics. Assess and evaluate regularly, keeping the goals you set at the start in the forefront. When implementing new technology, if you want to be successful you need to plan for, identify and address implementation challenges early, and gain the buy-in and commitment for technology – driving engagement, enhancing efficiencies and improving user adoption – enabling you to maximize your return on investment. Otherwise, your technology is just an expensive tool that no one uses effectively. This was originally published on the Tolero Think Tank blog. Scott Span, MSOD, is CEO & Lead Consultant of Tolero Solutions, an Organization Improvement & Strategy firm. He helps clients in achieving success through people, creating organizations that are more responsive, productive and profitable -- organizations where people enjoy working and customers enjoy doing business.